Little kids need safe and comfortable floors to play and move around on. They can also be quite messy, making it necessary to install flooring you can clean with ease. You can consider various flooring materials for a house with small children including. A carpet is one of the most comfortable forms of flooring available. It can protect your kids from bruises and bumps when they fall. Carpeting also provides a warm surface for your children. Your kids can walk and play on carpets during all seasons. Choose carpets made from natural materials such as jute, sisal, cotton and wool. Synthetic materials tend to contain chemicals that can be harmful to your child. Carpets should be cleaned regularly to prevent mildew, dust mites, and mold build up. Dark-colored carpets are a good choice because they are less likely to stain when your children pour food or liquids on them. Wood is durable and quite easy to clean, making it a great choice for a house with little kids. Select hardwood for a classy look. Add some area rugs to provide cushioning for your children. The rugs can provide comfortable playing areas. There are different types of wood you can use for your floor depending on how much you want to spend and style you desire. This material is a good option if you want an Eco-friendly floor. Bamboo is strong and durable. It is also cheaper compared to hardwood. The material is scratch resistant. This means your kids can play on it with various toys without damaging it. Bamboo does not warp, allowing it to remain in great condition when your kids pour liquids on the floor. This is another great choice for a home with little children. 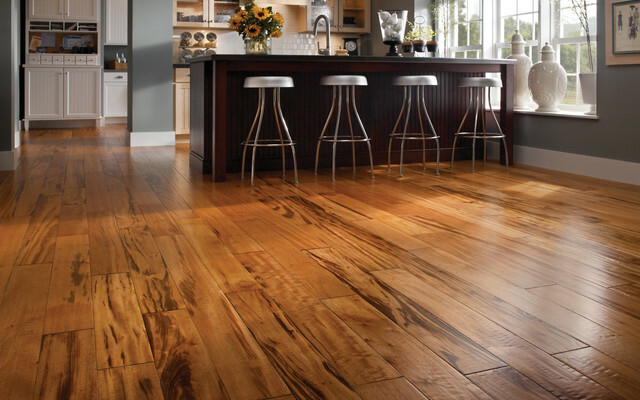 Laminate is an affordable flooring material that you can install in any part of your house. It is also easy to install, allowing you to make additional savings. Laminate does not scratch easily. You can also clean it with ease and this means you do not have to spend several minutes clearing spills from the floor. Select zero-emission laminate for your home to protect your children from harmful chemicals. Natural laminate is a great option if you want a safer material. Laminate is available in different designs and colors, allowing you to get a classy look without spending too much money. Choose one or a combination of any of these materials for your floor. Your child’s safety and comfort should be your main considerations when you make a choice. Think about the effort it will take to keep the material clean. The best floors are the ones you can simply mop or vacuum in a few minutes. All these materials come in different sizes and designs to match your home’s décor and personal style. Prices also vary widely depending on the size and style you prefer. Select a material that will work well in your home and ensure your kid’s remain healthy and protected. The option you select also needs to withstand a lot of traffic.